The Twin in Berlin: Just Meeting With An Investigator, That's Normal, (Right) oder?? NOT IN MY PAST 4 TRANSFERS OR SO. Just Meeting With An Investigator, That's Normal, (Right) oder?? NOT IN MY PAST 4 TRANSFERS OR SO. lololol Hermana (Megan) Mittleman just throwin' out that they had a baptism like she's talking about the good book she came across the other day. ALRIGHTY THEN. hahaha nur spaß. THAT’S SO COOL. I was totally stoked when I read that!!! Man, that's really cool. SOoooo this week was coool. This guy we found last week met with us again, Edmund, we talked about the Book of Mormon and Joseph Smith, He even came to church last week! That was a cool miracle. He couldn't make it this week, but we meet tomorrow, so hopefully we can ask him more about how he is feeling about it all. We were able to meet with Frau D A LOT this week, which is reallly a dream come true. Meeting with someone who IS INTERESTED. I know what some of you may be thinking.... Just meeting with an investigator, that's normal, oder?? NOT IN MY PAST 4 TRANSFERS OR SO. Seriously can we all just take a moment to appreciate all the little miracles in our lives that we take for granted. Thank you! Now do it again!! 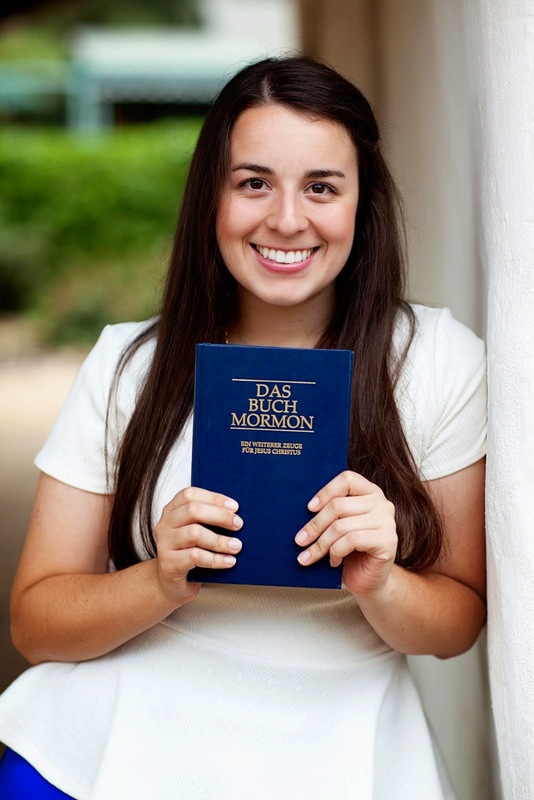 We have been through the basics with her, the Book of Mormon, and Joseph Smith. We watched the restoration short film with her, and she totally cried!! We were all feeling the spirit there in her little kitchen pretty strongly. She is pretty informed, like I said. So a lot of the time she just asks questions about how things work, or doctrine specific questions. I love her! She came to church with her husband, and her 8 yr old, and their little baby. They looked like a normal cute little family sitting there! So we went and talked with her this morning, we were going to bring a joint teach, but that fell out. Schade! So there are some personal things she wants to take care of that are troubling her, so she is unsure if she will make the 9th of May. BUT she still knows she wants to get baptized SOONer than later. Both Sister Brim and I know she can totally make it. We are hoping that as we continue to meet and as she comes to church, and grows in testimony she too will realize she is ready, and worthy to enter into this covenant. We have still to start 'formally' teaching her husband and other kids, but that's a work in progress! They're such a cool family!!! One of our less actives came to church yesterday, she actually knows Frau D and helped her in the process of choosing to meet with the missionaries!!! She had come last week, and last week AND this week she stayed allllll three hours!!! And then after the second hour, we were just sitting there waiting for FHV (Relief Society) to start, and all of a sudden she throws out 'I quit smoking!' and we were just speechless almost. MIRACLE. She is such a low key quiet lady, I love her. No quatschin around with her. We meet with her tomorrow so I am excited to talk more!! So with G7 there were police EVERYWHERE in the middle of the city. They even rerouted all the busses to go around instead of through. That was a teensy bit inconvenient but okay. We came out of a store last Monday, and there in the street there were all of these people with flags and then this truck with music blaring out. Super awesome and had demonstration written all over it. hahahha there were a few moments like that this week, but other than, that, nothing too crazy! Funny moment- we were klingeling, and I pressed the bell, and then it got stuck!!! I could totally hear it ringing from inside and then this old lady opened the door and I was standing there trying to get the little button unjammed. Haha that was really funny. Wish y'all could have seen that moment. Everyday, in my own life, and in just observing the lives and conversations of others, I am continually reminded of how hard life is. It's pretty rough sometimes. It's not easy. I have totally had those moments, where I just sit there and think, "why does this have to happen?" WHY. That is a gooood question. After much thinking and contemplating I have realized the simple answer. LIFE IS JUST THAT WAY. I know that everything serves a purpose in our lives. I know it. I know that Heavenly Father has something in store for each of us. But we have to show our faith in Him and keep pushing forward. No matter how small our progress is. He will help us to understand. We don't understand everything He does. We just don't!!! Something we just have to accept. I know that through the Savior, everything is possible. We can get the comfort and strength we need. I know that God loves us. His plan is perfect. We have so many reasons to rejoice. I love you. 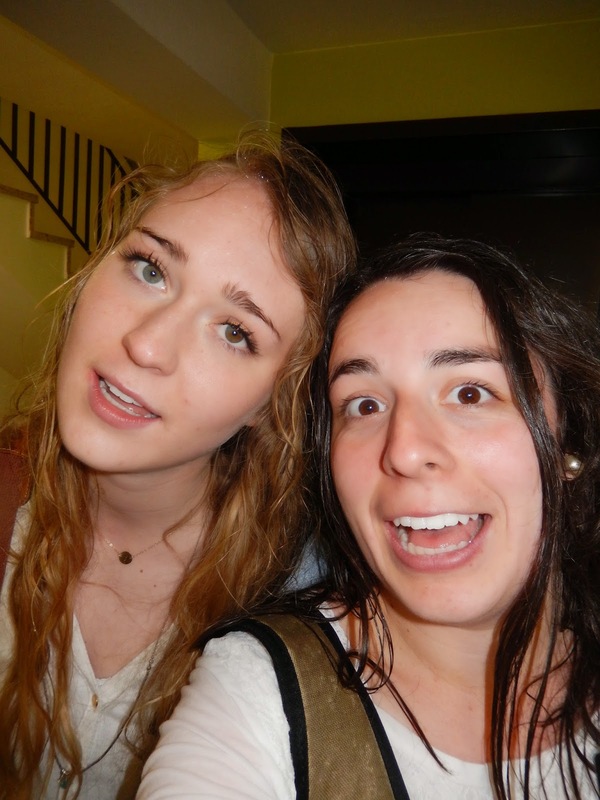 Sis Brim & Madison getting caught in the rain!